Despite the rain and chilly temperatures, on February 3, the Las Vegas community rallied in support of Ronald McDonald House Charities of Greater Las Vegas (RMHC) to stock the shelves for an entire year! 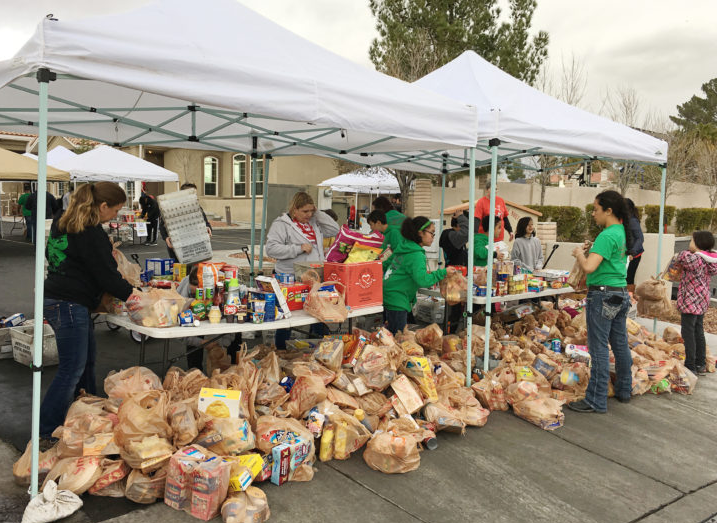 Residents throughout the Las Vegas Valley went to their local Smith’s and donated more than 17,500 pounds of food and household supplies to support RMHC families. RMHC provides families with their basic needs so that they can focus on what matters most – the recovery of their child. In addition, more than $13,000 was raised from cash and gift card donations. More than 250 volunteers came together to make this food drive possible by passing out wish lists at the 37 Smith’s Food and Drug Store locations, as well as collecting, sorting, dating, and weighing the donations to stock the pantry shelves at the House. Longtime supporters made generous donations to RMHC by donating checks as well. Generous donations to RMHC including a $1,000 check donation from Smith’s and a $500 check donation from Nevada Farm Bureau. There are many ways to support Ronald McDonald House Charities, to learn more go to https://rmhlv.org/donate/ways-to-donate/.